She studied singing at the Conservatorio Giuseppe Verdi in Milan and made her debut in 1924 as contralto. In 1926 she sang a huge number of parts at the Teatro Colón of Buenos Aires, where on 23. 7. 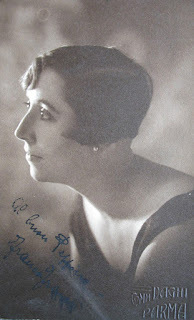 1926 she also participated in the premiere of the opera ‘’Ollantay’’ of the Argentine composer Constantino Gaito. In 1928 she made her second debut at the Teatro Coccia in Novara as Marina in ‘’Boris Godunov’’. As dramatic soprano she appeared primarily at the Italian provincial operatic stages.